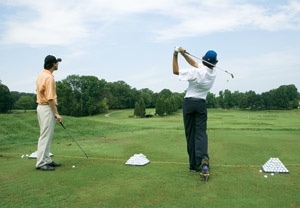 National Golf Club's 2.5-acre tour-quality practice facility, considered the best in the area by Members and guests alike, is the place for golfers of any caliber from the beginner to the junior, to the top amateur or aspiring professional to fine tune their game throughout the year. During inclemate weather, Members can use the indoor facilities. National's Golf Members enjoy unlimited use of the natural grass range with 16 target greens ranging from 25 to 250 yards, great for working on your wedge game, irons, fairway woods and driver. 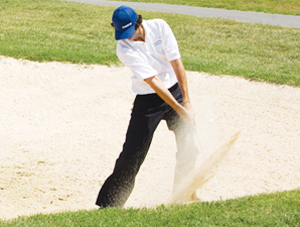 Practice your pitching, chipping and bunker shots at the short game area. The putting greens roll just like the rest of our greens… perfect and true. The facilities are backed by an experienced staff of PGA Professionals, dedicated to helping Members get more enjoyment from the game. Individual and group lessons are taught by the Terry Shaffer Golf Academy Click Here for More Information. For more information, please contact the Golf Shop at 301.292.1100.